The Athame is a knife-like tool used to channel energy and casting the circle. 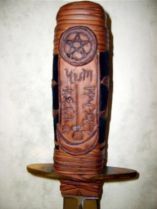 Traditionally, an Athame would be black handled, though many other styles are used according to personal preference. Generally an Athame is not used to cut anything material. It symbolizes the Fire or Air elements which varies according to tradition. This beautiful hand made athame is pewter body with stainless blade. This is a highly detailed item. All are handmade with lead free pewter called Britannia. It is an older European pewter used with copper from the north regions which gives the metal a brighter color. Each piece is dipped in a clear surface treatment to help maintain the high polish. Individual designs, crafted with artistic patience and always different (customizing available). 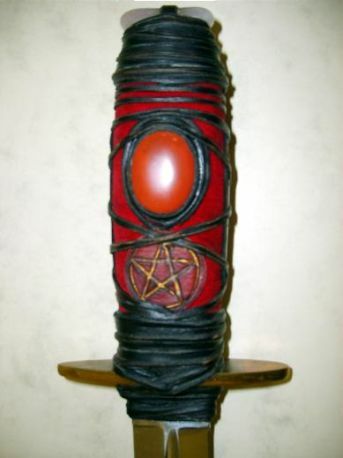 Order the Plain Black Handle Athame or have it covered! 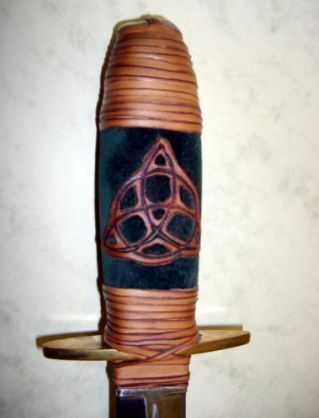 Athame coverings are hand crafted using either black, brown, green, beige, maroon patchwork buckskin with coloured velvets. 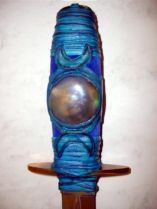 Various crystals are set into handle. 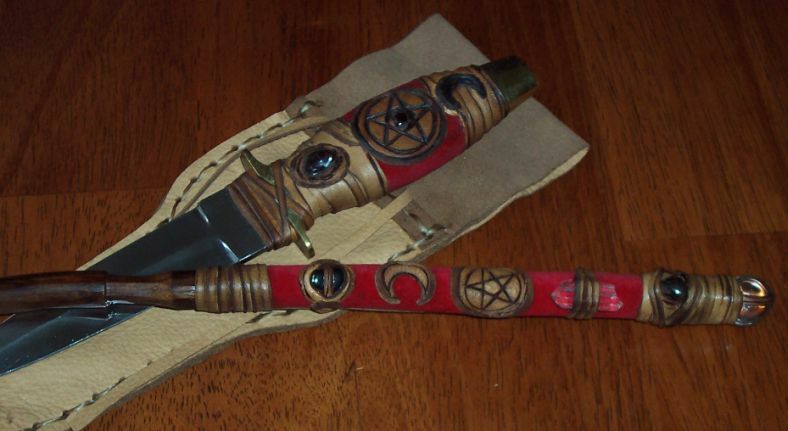 These Athame coverings are extremely well made. They come with the black standard sheath shown or a matching soft buckskin sheath can be made (extra cost). Individual designs, crafted with artistic patience and always different (customizing available). 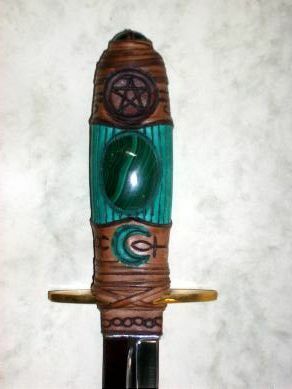 Athame coverings are hand crafted using either gold, black, brown, green or patchwork buckskin with coloured velvets. Various crystals are set into handle. 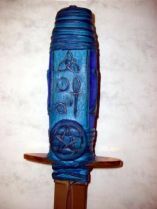 These Athame coverings are extremely well made. 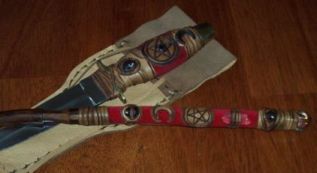 They come with a matching soft buckskin sheath in brown or black. 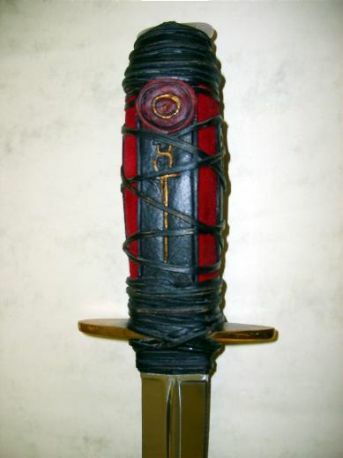 Have Your Own Athame Covered - $66.00. 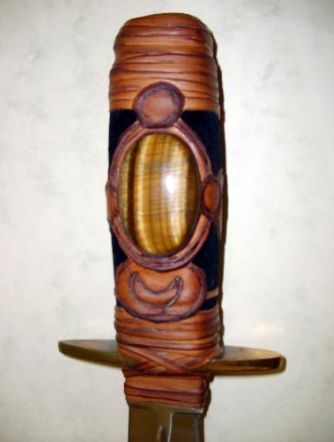 Why not have your Athame handle covered for a new look? Order here. Rosewood Handle/Brass crossbar & pommel - Length 22.5cm/13cm blade. 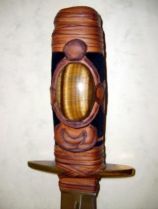 Handle covered/buckskin sheath - $155. See our Custom Athames page for more information. 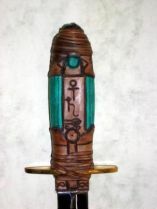 Rosewood/Brass Athame - Plain - $90. See image and order here. Includes plain leather sheath. 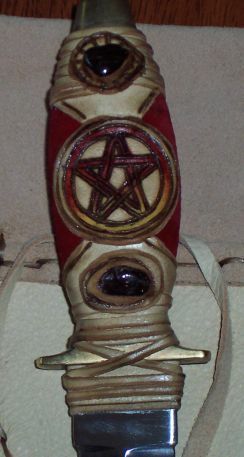 Brown buckskin covering with red velvet inlay, set with Amethyst stones. $155 - Front & back view. COVERING - Black buckskin with red velvet inlay. Features clear Quartz crystal point in centre of handle. Egyptian style design. Length - 22.5cm. 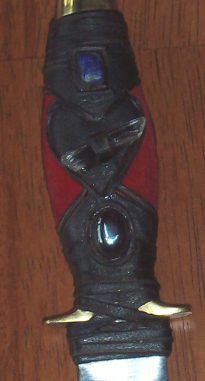 Blade - 13cm. COVERING - Black buckskin with azure blue velvet inlay. 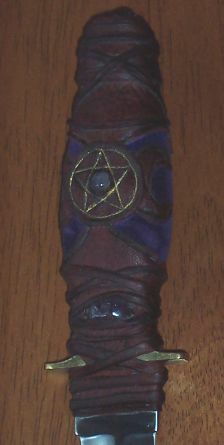 Features Hematite crystals & Lapis crystals set in handle. Egyptian/Pentagram style design. 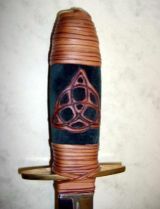 COVERING - Brown buckskin with red velvet inlay. 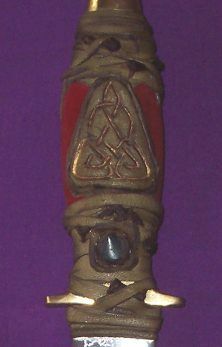 Features garnet in centre of handle. 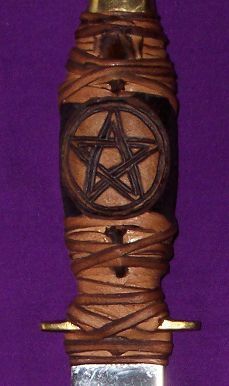 Pentagram style design. 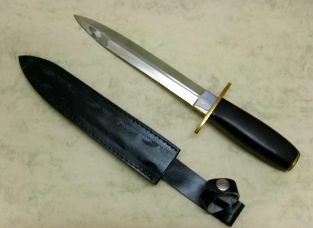 Elegantly simple blade with natural rosewood handle, brass trim and includes a plain leather sheath. 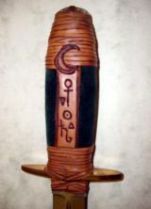 Use as is or carve your own symbols on the handle, stain or paint to suit your particular tradition. Brass pommell and cross bar. All Items featured herein are sold as Curios Only !